BackgroundResveratrol is a natural compound suggested to have beneficial health effects. However, people are consuming resveratrol for this reason without having the adequate scientific evidence for its effects in humans. Therefore, scientific valid recommendations concerning the human intake of resveratrol based on available published scientific data are necessary. Such recommendations were formulated after the Resveratrol 2010 conference, held in September 2010 in Helsingør, Denmark.MethodologyLiterature search in databases as PubMed and ISI Web of Science in combination with manual search was used to answer the following five questions: 1Can resveratrol be recommended in the prevention or treatment of human diseases? ; 2Are there observed “side effects” caused by the intake of resveratrol in humans? 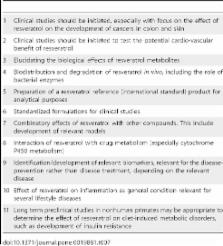 ; 3What is the relevant dose of resveratrol? ; 4What valid data are available regarding an effect in various species of experimental animals? ; 5Which relevant (overall) mechanisms of action of resveratrol have been documented?Conclusions/SignificanceThe overall conclusion is that the published evidence is not sufficiently strong to justify a recommendation for the administration of resveratrol to humans, beyond the dose which can be obtained from dietary sources. On the other hand, animal data are promising in prevention of various cancer types, coronary heart diseases and diabetes which strongly indicate the need for human clinical trials. Finally, we suggest directions for future research in resveratrol regarding its mechanism of action and its safety and toxicology in human subjects. Copyright statement: This is an open-access article, free of all copyright, and may be freely reproduced, distributed, transmitted, modified, built upon, or otherwise used by anyone for any lawful purpose. The work is made available under the Creative Commons CC0 public domain dedication. Prognosis of multi-lobar pneumonia in community-acquired pneumonia: a systematic review and meta-analysis. The 2001 Canadian recommendations for the management of hypertension: Part two--Therapy.